With just one minute left until the waiver deadline, the Houston Astros pulled off one of the biggest trades of the summer. 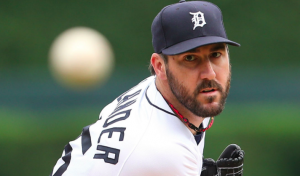 The Astros acquired longtime Detroit Tigers ace Justin Verlander for three prospects. As part of the deal, the Tigers are receiving pitcher Franklin Perez, outfielder Daz Cameron, and catcher Jake Rogers. Houston has been searching for a frontline starter since last offseason. Dallas Keuchel has returned to being the team’s ace this season. However, he’s had two stints on the DL and has struggled during the month of August. The Astros are also waiting for Lance McCullers Jr. to return from injury after missing all of August. Charlie Morton and Collin McHugh have helped give Houston’s rotation good depth this season, putting the Astros in good shape heading down the stretch. But Verlander gives the Astros another Cy Young winner with postseason experience to lead them to the World Series. After a mediocre first half of the season, Verlander has kicked it into high gear the second half of the season. In 10 starts since the all-star break, Verlander is 5-2 with a 2.41 ERA. In his recent starts, he’s proven to still be the ace we’ve known him to be for years. That pushed the Astros to finally meet Detroit’s asking price and acquire the ace they’ve been seeking. The Astros don’t need Verlander to finish the regular season on top of the AL West. However, the team has been on cruise control for a while. The Astros could use a jumpstart to get themselves on track and playing at their best before the playoffs begin. Acquiring Verlander could be just the thing they need to make that happen, in addition to being an invaluable postseason asset. Of course, Verlander is also a long-term asset for the Astros. He is set to make $56 million over the next seasons with a $22 million vesting option for 2020. The Tigers have pledged to pay at least $10 million of that. But the Astros will be on the hook for the rest. Nevertheless, the Astros will have Verlander to anchor their rotation for at least two more seasons. Meanwhile, Detroit’s August fire sale continues after sending Justin Upton to the Angels Thursday afternoon. Earlier this summer, the Tigers also traded J.D. Martinez, Alex Avila, and Justin Wilson. However, this is the team’s most fruitful trade, with the Tigers acquiring three top prospects. Perez was Houston’s 3rd best prospect and 46th in baseball, according to MLB.com. He has a 3.02 ERA between advanced-A and double-A this season. Cameron, the son of former big leaguer Mike Cameron, was Houston’s no. 9 prospects. His stock has fallen recently, but he’s had a strong second half and is a potential five-tool player. Rogers was Houston’s no. 11 prospect and the 8th best catching prospect in baseball. His strong defense and arm should at least make him a major league back up. He’s also having a strong offensive season in A-ball. Ultimately, this is a great deal for both sides. The Astros make a major addition to their rotation for both the upcoming postseason and the years to come. Detroit also frees itself of most of Verlander’s contract, while also adding three quality prospects for their rebuilding effort. It took all summer, but both teams were able to complete the deal they long wanted to make. Charlie Morton, Collin McHugh, Dallas Keuchel, Daz Cameron, Detroit Tigers, Franklin Perez, Houston Astros, Jake Rogers, Jim Crane, Justin Verlander, Lance McCullers Jr.